The Porsche 944 was an experiment in the front-engine rear drive coupe format from Porsche and followed after the lowly 924 and lofty 928. The 944 was only available with inline-4 cylinder engines and the turbocharged version was quick, but lacked the immediate oomph provided by a big lump of V8. One easy way to fix that is...swap in the most plentiful modern small-block available. Find this 1985.5 Porsche 944 w/Chevy LM7 V8 for sale in Detroit, MI for $12,000 via craigslist. The LM7 is a 5.3 liter (325 cubic inch) cast iron block version of the GM gen III V8 originally installed in trucks and is sometimes mistakenly called an LS by the unwashed masses. It does share the overall architecture like bell housing bolt patterns, bore spacing and other key features with the LS series of car engines, which allows higher performing LS cams, intake, heads and various other parts to be used for performance gains. Being an understressed iron block V8 with 6-bolt main bearing caps, it is an extremely stout motor for boosted applications. 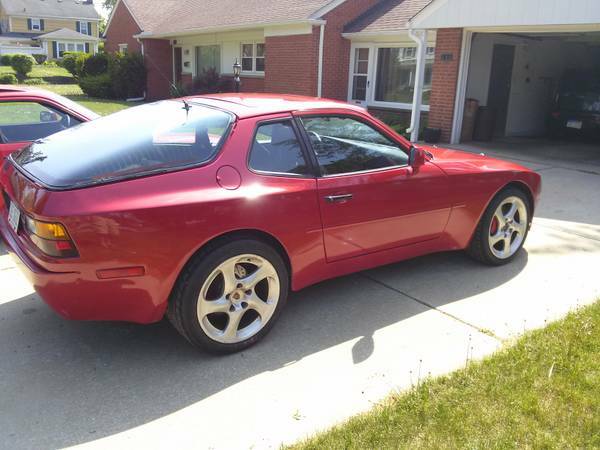 The seller of this 944 claims the LM7 now puts 300 horsepower to the rear wheels through an upgraded rear-mounted 944 Turbo manual transaxle. This is more than twice the original power at the pavement for the 944 - which should make for a great burnout machine. "The handling and driving dynamics the 944 was famous for with the power of an American V8!" Should be: "The handling and driving dynamics the 944 was famous for, with the power of an American V8!"